Searcy String Works: Zombie Stomp! Ok, so you guys know that I make and repair pickups and occasionally build a guitar or bass. I bet you didn't know that I'm a total stomp box junkie though. Like most kids that started out in the 80's I was impressed by the pedal boards of guys like Eddie and Randy . I had a small collection of about 5 Arion and MXR effects back then. Then in the early 90's I traded all those in for a Digitech rack mount system at Ed's Guitars in Miami. In the late 90's I got into the multi effects pedal boards like #11 in this picture. That's only part of the collection by the way. Eventually I ended up back where I started when my wife bought me a nice MXR 2000 Series Phaser just like the one I had when I was 14. Suddenly it all came back to me. The endividual personalities of small stomp boxes are what make them so great. An MXR Phase 90 is different than an Electro Harmonix Small Stone. Moving them around in the signal chain can make a huge difference. I have even started doing some mods on a few pedals. In the feature I want to do some demos of some of the stranger pedals I have. Keep an eye out for those. 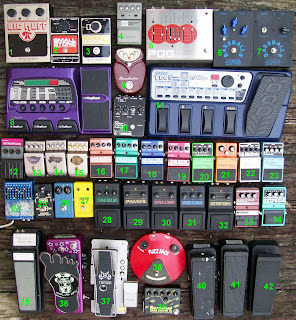 Damn, and I thought I collected piles o' pedals! You need a Vibrothang and one of Charlie Falco's BroTech pedals, dude. I went the other way, one cord, one amp and onboard nasty distortion in the guitar. Mileage varies, desired mayhem is still the end result. Wow! I have finally drawn the famous Ellie to my blog! Now that's accomplishing something. Yea, A Vibro Thang is on my list of things the check out. And I plan to get a Fat Pipes from Charlie one of these days. Interestingly enough I have been working on some totally new material. Now, after years of recording directly to the computer through tons of distortion I find myself recording these days with my tube amps with a decent SM57 mic and favoring more simple setups and subtle effects like EQ or Compressor. There is nothing for guitar like the snap of a good tube amp.